Narendra Modi in South Korea: On the first day of his visit, PM Modi unveiled a bust of Mahatma Gandhi at the prestigious Yonsei University in Seoul along with South Korean President Moon Jae-in and former UN Secretary-General Ban Ki-moon. Prime Minister Narendra Modi today laid a wreath at the national cemetery in Seoul and paid tribute to the fallen soldiers, including those who died in the Korean War. PM Modi arrived on a two-day visit to South Korea on Thursday to strengthen India's strategic ties with the country. On the first day of his visit, PM Modi unveiled a bust of Mahatma Gandhi at the prestigious Yonsei University in Seoul along with South Korean President Moon Jae-in and former UN Secretary-General Ban Ki-moon. 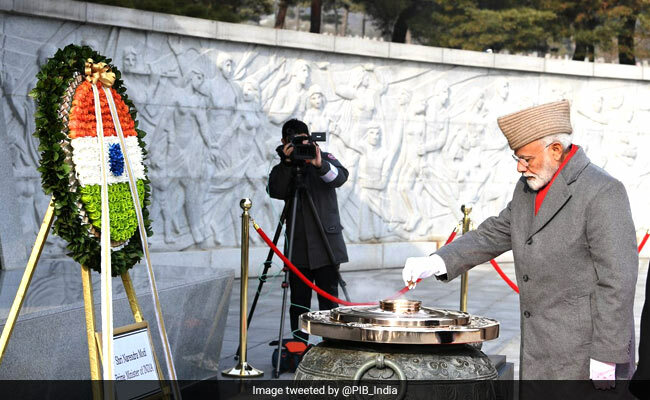 "PM Narendra Modi laid a wreath at the National Cemetery of Republic of Korea that entombs remains of 165,000 martyrs and paid homage to the fallen soldiers," External Affairs Ministry Spokesperson Raveesh Kumar said. Established in 1956, the Seoul National Cemetery is reserved for Korean veterans, including those who died in the Korean independence movement, Korean War and Vietnam War. The prime minister was also accorded a ceremonial reception at the official residence of South Korean President Moon. "PM Narendra Modi was accorded an official reception at the The Blue House, the executive office and official residence of President Moon in Seoul," Mr Kumar said in a tweet. PM Modi is visiting South Korea on the invitation of President Moon. This is his second visit to the Republic of Korea since 2015 and second summit meeting with the South Korean president. The prime minister will receive the Seoul Peace Prize announced by the Seoul Peace Prize Foundation in October last year. Earlier in his departure statement, Prime Minister Modi said his visit was reflective of the importance "we both attach to our relationship".